La guide des chemins de France, reueue & augmentee pour la troisiesme fois. Les fleuues du royaume de France, aussi augmentez. A Paris : Chez Charles Estienne, Imprimeur du Roy, 1553. Charles Estienne was the son of the Parisian printer Henri Estienne. He studied medicine with Jacques Dubois (who also taught Vesalius) and received his doctorate from the faculty of medicine in Paris in 1542. He was one of the first to question the stock of knowledge handed down by Galen and the classical tradition of anatomy by comparing those principles with his personal observations. When his brother Robert left Paris for religious reasons and settled in Geneva as a printer in 1550, Charles took over the family business in Paris. Although Robert had joined Jean Calvin, Henri II's esteem for the Estienne family was such that Charles was immediately appointed King's Printer -- a title formerly held by his brother Robert. Charles was a man of encyclopedic erudition and intellectual curiosity, who excelled in sciences, history, philology, lexicography, and rural economy. His numerous publications in these various fields reflect his pedagogical interests and his awareness of the potential of the printing press as an agent of social transformation. He went bankrupt, however, and was imprisoned for uncollected debts in the Châtelet for several years. Indeed, he is said to have died in prison. 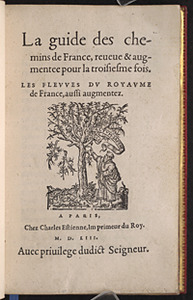 La guide des chemins de France exemplifies Charles Estienne's practical mind. 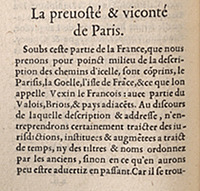 The work was published anonymously in 1552 and is the first guidebook of France with comments. It quickly became a model for subsequent authors of guidebooks and for cartographers. La Guide offers functional advice for travelers. Its small format made it easy to take along during a trip, and an index of names and abbreviations continues to facilitate consultation to this day. The book consists of a series of itineraries from Paris and is organized by regions. A brief introduction highlights the resources and the history of a particular region. It is followed by a list of the major cities and towns, along with the distances (in “lieues” and miles) between them. These distances can usually be covered by foot or by horse in one day. In addition, La Guide suggests places to eat and to stay, and provides information on the etymology of some names, as well as on local points of interest for travelers from various backgrounds. 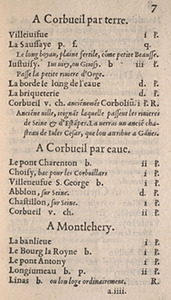 A list of the rivers of France completes the work. Charles Estienne drew his information from diverse sources, including pilgrimage guidebooks and anecdotal information given by travelers. His work participates in the gradual movement toward political consolidation of 16th-century France. It is also indicative of the increasing circulation of people and goods around the kingdom. That La guide des chemins de France filled a gap and met a need is evidenced by its 28 editions from 1552 to 1668. Gordon 1553 .E78 is comprised of two parts: the expanded Guide des chemins de France, reueue & augmentee pour la troisiesme fois…, followed by Les Voyages de plusieurs endroits de France: & encores de la terre Saincte, d’Espaigne, d’Italie, & autres pays. In the Gordon volume, the binder mistakenly switched the following pages (with the same page numbers and signatures) in the first and second parts: pages 33-48; 51-54; 59-62; 65-82; 95-112. 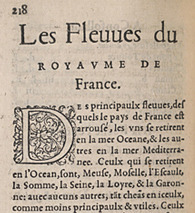 The second part of the Gordon volume, Les Voyages de plusieurs endroits de France: & encores de la terre Saincte, d’Espaigne, d’Italie, & autres pays, with Les Fleuues du Royaume de France, was published by Charles Estienne in 1552, just after the first edition of the Guide. 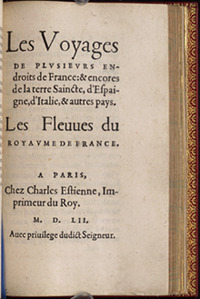 The Voyages provided itineraries for pilgrimages within France, as well as to the Holy Land, Spain, and Italy. Some of the same information appears in both the Guide and the Voyages, but the second work was composed specifically for travelers on pilgrimages. Their similar layouts and the overlap of information between the two works most likely contributed to the binder’s errors. Click on the following link to consult the alternate digital gallery for this volume, with the pages in their originally intended order (binder's mistakes "corrected"): Gordon 1553 .E78 – Corrected page order. Estienne, Charles. 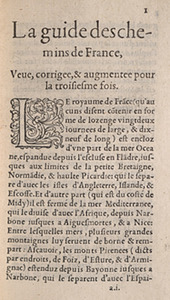 La Guide des chemins de France de 1553. Ed. Jean Bonnerot. Paris: Champion, 1936, 2 vols. Geneva : Slatkine Reprints, 1978. Skenazi, Cynthia. "Une pratique de la circulation. La Guide des chemins de France de Charles Estienne." Romanic Review 94, 1-2 (2003): 153-166. Full text available through MLA International Bibliography. The 1552 edition of La Guide des chemins de France is available in .pdf format from Gallica. Materials on this page were generously contributed by Cynthia Skenazi, University of California, Santa Barbara (2007).